I watched a movie based on an H.P. Lovecraft story during last year's Project Horror. Now that I reread that post, I notice that I actually mentioned tonight's movie, Re-Animator! Now, unfortunately, I was supposed to watch this tonight, and have Scott guest blogging it with me, but things went awry. Check out my other post from tonight for the full explanation. Anyway, he'd already sent me his writeup for Re-Animator, and it was too good not to use, so tonight you get a double feature! Here goes. Let me just go ahead and get this out of the way first...Re-Animator is bug-nuts CRAZY (oh, but gloriously so!). This campy horror cult classic from 1985 follows Dr. Herbert Ross, a highly-intelligent med student who has concocted a bright green serum that can bring the dead back to life if injected shortly after the moment of death. Re-animation ain't pretty though, as the subjects when revived turn out to be snarling, out-of-control zombies. Ross is aided by his reluctant roomie, viewed suspiciously by his roommate's fiancee and envied by his jealous professor. Things really get wacky when said professor is beheaded, injected with the serum himself and kidnaps the fiancee. It's up to Ross and his roomie to save the girl and put a stop to the crazed professor. You might gather from this synopsis that Re-Animator is not for everybody and you'd be right! But if you have a strong stomach and a high tolerance for insane, gross out horror, then this is the movie for you. Some of the acting borders on Rocky Horror bad but this Frankensteinian flick goes for broke and that makes it endearing (in a sick and twisted kind of way). It goes so over the top, you can't help but laugh at it and the filmmakers know exactly what they're doing. Whatever little budget they had, they spent on special effects and they are just as good and nasty as anything Rick Baker, Rob Bottin or Greg Nicotero has ever done. 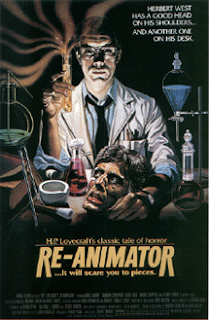 I remember going to see a midnight reissue of Re-Animator at the old Inwood Theatre in Dallas sometime in the early 90's and to see this film with a crowd is quite an experience (and it's sequel, Bride of Re-Animator, is almost as much fun). Shocking, depraved, repulsive, pervasive - all of the above applies to Re-Animator. The finished film may not exactly be what H.P. Lovecraft had in mind when he wrote the story on which this is based on but it's sure something special. In fact, I'm certain it would make shock-horror auteurs Roger Corman and George Romero blush...and perhaps vomit. Re-Animator gets 4 re-animated heads out of 5. Scott made me promise that I'd still watch this at some point, and I will!